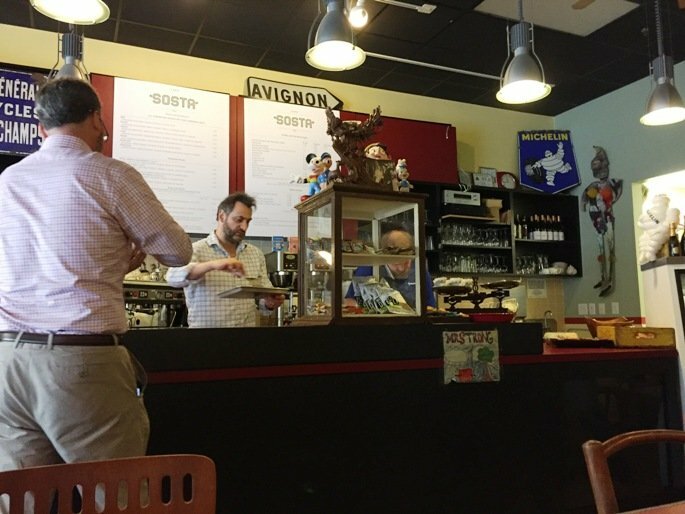 Sosta Cafe in Raleigh, a Hidden Gem for Sandwiches and More! 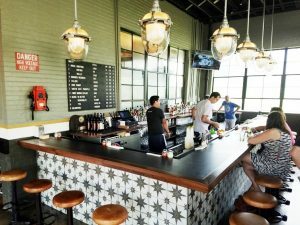 Even though I’ve lived in the Raleigh-Durham area for over 10 years, sometimes a popular spot will slip past my foodie radar screen. Take Sosta Cafe for example. 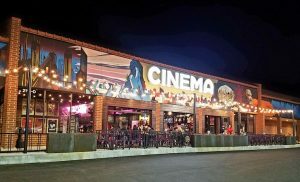 I had seen reviews for the place over the years and it sits on a block on Davie Street along with Calavera, Oak City Meatball Shoppe and Buku, three very popular spots I’ve eaten at. And yet, somehow I kept on missing out on this eatery. But it’s not hard to understand why. With limited hours and a innocuous face, it’s easy to not notice the place. But yeah, I had to find out why this place was getting 5-star reviews so it was time for a visit! 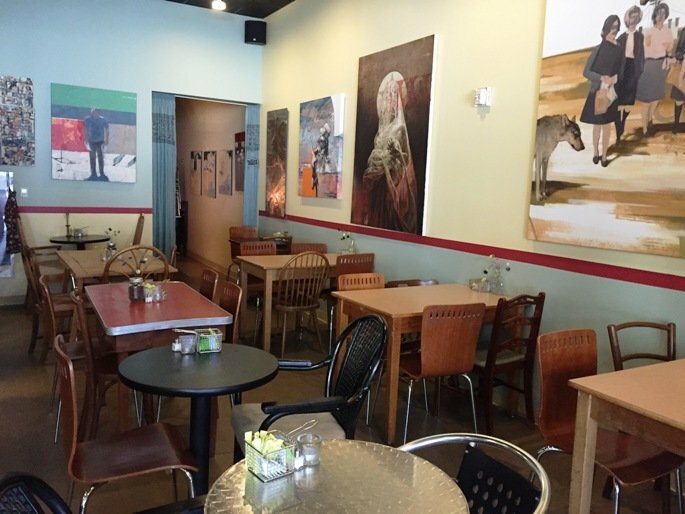 As soon as you step inside of Sosta Cafe, you’ll notice all the personal touches to their space, this certainly ain’t no chain! 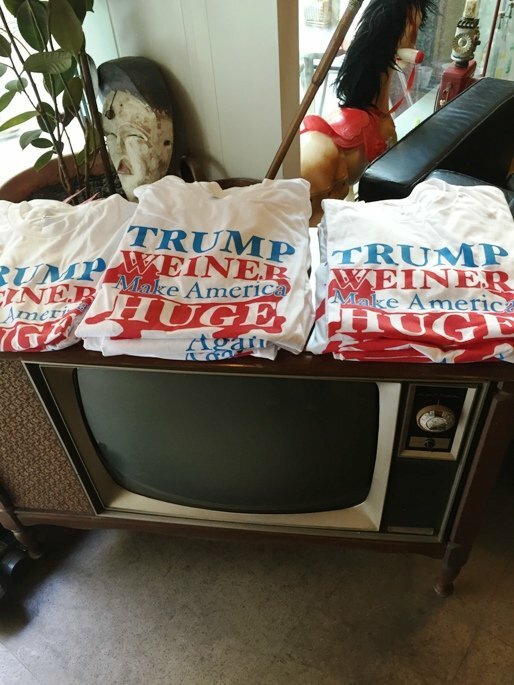 At the entry-way is an old school, antique TV covered in humorous Trump t-shirts. A mish-mash of odd chairs and tables are packed into the space without a common theme. On the walls are large funky prints and European music is wafting overhead It feels as if you’ve been transported outside of the US but I’m not exactly sure where! But it’s all cozy, comfortable and clean which works for me. I pop on over to the order counter where some regulars are waiting for their take-out order. 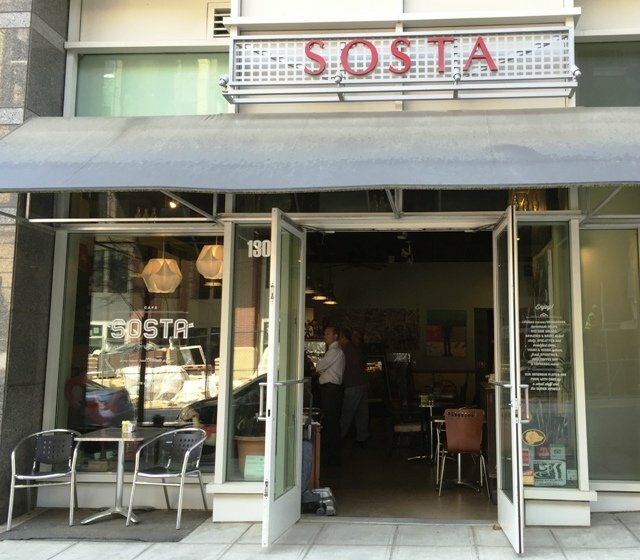 Sosta Cafe has a small selection of sandwiches but good options for vegetarians. Sandwiches are in the $9 to $11 range and comes with two sides, choose between Israeli cous cous, chickpea salad or cannellini beans. I go with the Guido (roast beef) along with an aranciata for my bevvy. Lunch is about $12 and I go find a table to hang loose and wait for mah food! It takes about 10+ minutes for my food because the place is sort of small and busy, but it’s got to be worth it, right? My sammich shows up and it’s a very nice looking plate. 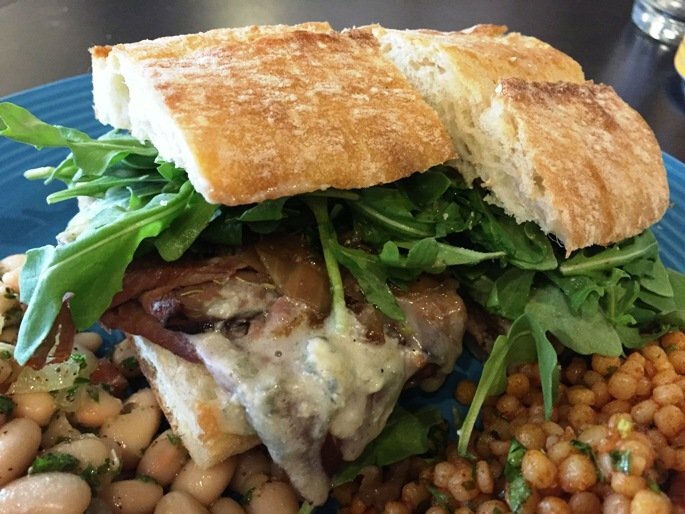 The sandwich shows off a lot of great color and texture: warm, sliced beef with melty gorgonzola with carmelized onions and bright green arugula. The ciabatta bread is lightly dusted with flour and has great texture in chew. 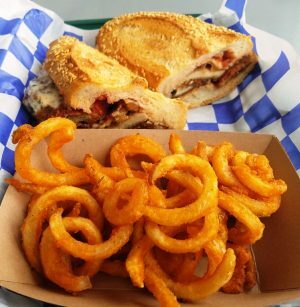 Overall a sandwich that pops with flavor and deliciousness. The side salads are also nicely done. The cous cous in a slightly spicy marinade while the beans are mixed with herbs and probably olive oil and more. A nice and healthy alternative to your typical fries. And the sandwich along with the two sides makes for a very satisfying lunch, thanks Sosta Cafe! Sosta Cafe is Love. They have amazing food and friendly staff. I love how much character it has, Anna! But I often forget about it for some reason. Thanks for the reminder!